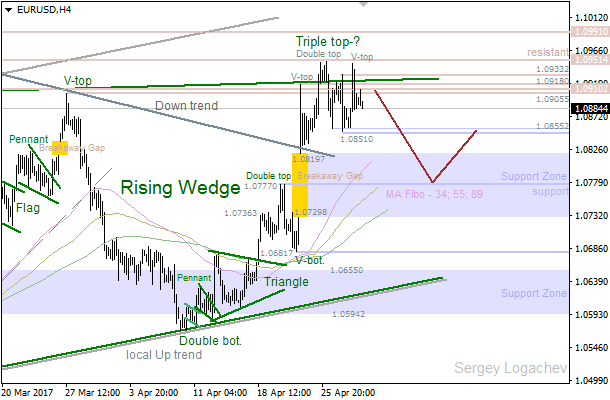 The price is still consolidating under a resistance at 1.0951. 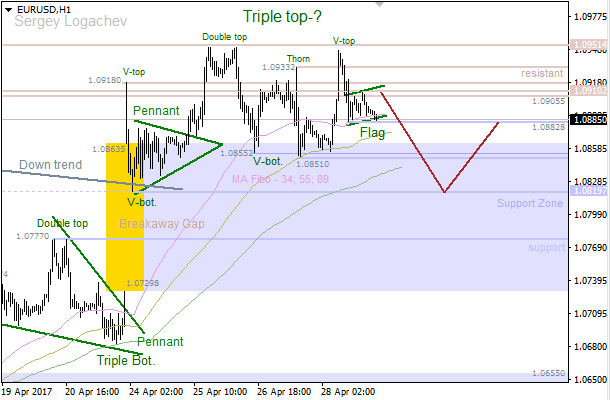 Also, there’s a developing “Triple Top”. If this pattern confirms, the market is likely going to decline towards a support at 1.0819 – 1.0729, which is near the last “Breakaway Gap”. If a pullback from this area happens, there’ll be an opportunity to have an upward price movement towards a resistance at 1.0851. There’s a “V-Top”, which led to a consolidation between the 34 Moving Average and the nearest resistance at 1.0910. At the same time, we’ve got a “Flag”, so bears are likely going to test the 89 Moving Average in the short term. If we see a pullback from this line, bulls will probably try to test a resistance at 1.0882.